What’s Next On the Blog ? The author hikes along one of the many surprise cool stretches of New Mexico on the Gila River alternate just north of Snow Lake. Back in April of 2018 when I started this blog and began my journey of thru-hiking the Continental Divide Trail, I had promised myself to create a blog entry for each “section” of the trail and post it to the blog as I hiked along. I considered sections to be each town where I pulled off the trail and resupplied, thinking I would take advantage of the hours (or a day) off to gather my thoughts and photos together. I managed to do this all the way through New Mexico and Colorado, but for so many reasons that I will get into eventually in another blog post, it was hard to do. Really hard. Jackrabbit, Natural, Jackrabbit and I (l-r-c ) pause at a trail head for a selfie. Hiking the CDT was exhausting and hiking it with fun people was sometimes distracting… in good ways! While there are lots of folks out there putting together blogs, podcasts, and creating video for YouTube on all sorts of topics (all valuable stuff), I still believe my experiences and the lessons I learned can be valuable not just to the hiking community, but for personal reasons of growth and leadership as well. Finishing the my 2018 CDT blog posts through Wyoming, Idaho, and Montana. 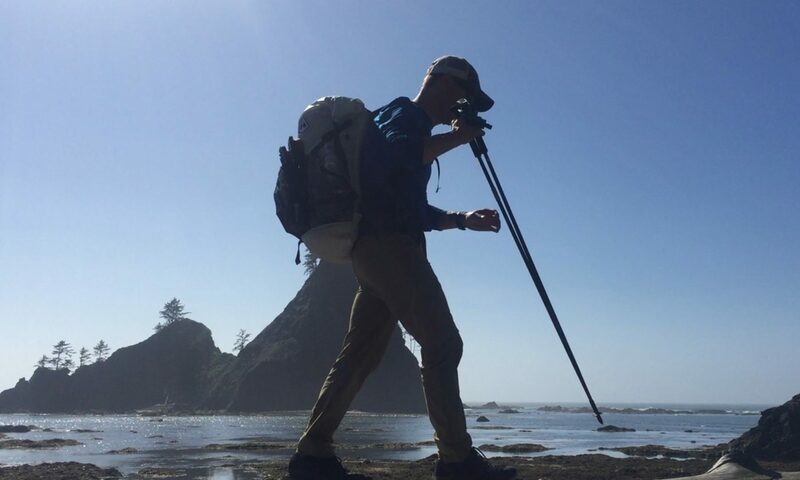 Adding additional follow up blog posts on topics covering food and resupply, gear, stewardship, group dynamics, leadership, injuries, reentry, and more. My hope is the stories, lessons learned, photos and videos will all hold some form of value for you and inspire others in the subject areas discussed. Here in Part Two, is our very last stretch on the Continental Divide Trail in 2018. Our initial permit got us from East Glacier north to Many Glacier in three easy days (Part One). On day four we woke for our day along the Highline Trail to Goat Haunt and camp, and day five would be eight short miles along Waterton Lake to the CDT finish. Instead, the backcountry ranger in Many Glacier met us as we woke, and let us know we’d need to make different plans as the trail was closed along Waterton due to a fire. Luckily, there is another border monument nearby so we headed in that direction. It’s eight minutes long and is full of music and audio as well. Grab a cup of coffee and enjoy. Make sure to view it in HD (change in your YouTube player settings), and let me know what you think! Here’s a recent guest appearance I just shot with Baskets for his CDT 2018 YouTube channel. We go over all the gear I carried on my CDT thru hike this year. Great for equipment geeks! Welcome CDT Class of 2018! Howdy folks! I finished the CDT on August 25th at the Chief Mountain Border Crossing. When we reached the town Many Glacier, we were diverted by the back country ranger away from finishing in Waterton National Park in Canada (and set our course to Chief Mountain, instead), where a fire had broken out on the west side of the lake. Alas, 3000 miles into the CDT and I finally was forced to change a route due to a fire… two days from finishing! After breakfast I contemplated Steamboat Springs and how much money lived in this town… people who’d made their fortune on good business investment, or people who’d made their money on flash in the pan investment like the current technology industry, or, people who simply didn’t have the easy script to write but that had lots of spare money nonetheless… to by a second, third, or even fourth vacation home in Steamboat Springs. This is the thing that struck me about Steamboat – nothing seemed authentic. Nothing and no one seemed like they were “originally” from Steamboat. The downtown felt manufactured and the “industrial” areas seemed only obligatory- and our trail magic hookup at Freshies, Natural and I walked to the bus stop where we went one long stop down to the Exxon station south of town and began to hitch. Same story as into town – car after car – with room, passed us by until another young woman in her 20’s picked us up who had previously been working for REI in Massachusetts (before moving to Steamboat), and who also had a friend who was currently hiking the trail. Madeline drove us to the point on the highway where we had stopped the day before and hitched to Steamboat, so we had her drop us off on the same spot and started hiking again from there. We hiked through very gradual and moderate terrain… mostly high, alpine lakes, marshy meadows, rolling openness kind of stuff. After an hour or so we came up on Fishhook Lake. I stopped and took a beauty break here and paused to reflect on a sign I’d seen earlier… “Rabbit Ears Pass…” and it said ‘named because of it’s appearance,’ which had to have looked like two rabbit ears, wouldn’t you think? Anyway… yes, I stopped and lingered here on a beautiful, late June afternoon in the middle of north-central Colorado. I couldn’t think of anywhere else I’d rather be. On a day that had started off with lots of threatening clouds, got windy and “meh,” it then settled down into a beautiful June afternoon in Colorado and in retrospect, turned out to be another wonderful and lush Colorado afternoon. We passed by a series of lakes… Lake Elmo, Round Lake, Lost Lake, Grizzly Lake, and then cruised by several more potholes and tarns above 10,000 feet on a trail appropriately named at this juncture, the Wyoming Trail. The trail cut through Routt and Jackson Counties in Colorado and wove us between the aforementioned alpine areas above 10k feet and lush, sparsely-treed meadows and soggy water features in their peak summer form. On day two out of Steamboat we had much more aggressive plans, and that was to simply get closer to hiking 30 miles for the day. We entered the Mt. Zirkel Wilderness area and upon reflection I was blown away by the views, the bird wildlife and just the fact that I’m half way across the Rocky Mountain west, in the middle of summer, in the middle of drought season, and in the middle of… just the darned middle of everything! I … Damn. I’m hiking the Continental Divide Trail. A journal of my thru-hikes, adventures in the Pacific Northwest and Southwest United States, and some gear talk.